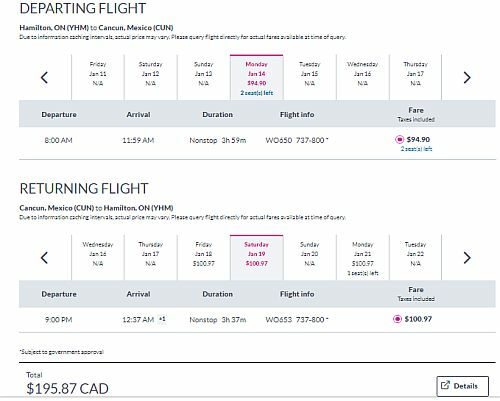 Swoop has dropped the price of their non-stop flights from Hamilton to Cancun and Puerto Vallarta, Mexico down to between $208 (personal item only) and $268 (with luggage) roundtrip. 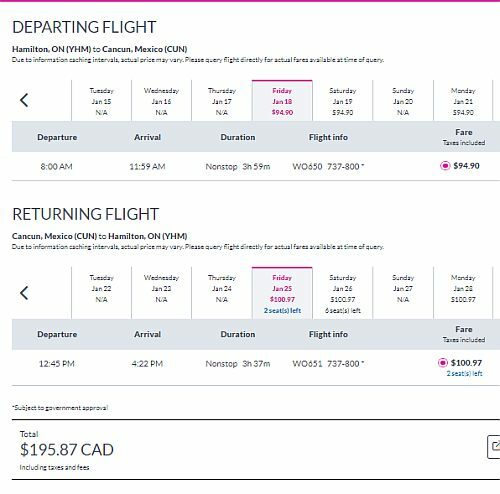 Flights from Hamilton to Cancun are actually a bit cheaper and start at $195 CAD roundtrip, while Puerto Vallarta is about $13 more. Keep in mind that $208 roundtrip is the base price, and includes *only* a personal item. Low cost carriers charge extra for *everything*. Carry-on bags cost around $38 each way, and checked bags cost $27 each way. $268 CAD roundtrip is the more realistic price to use when comparing against other airlines. Cancun (CUN): look for the dates that are $95 on the way there, and $101 on the way home. 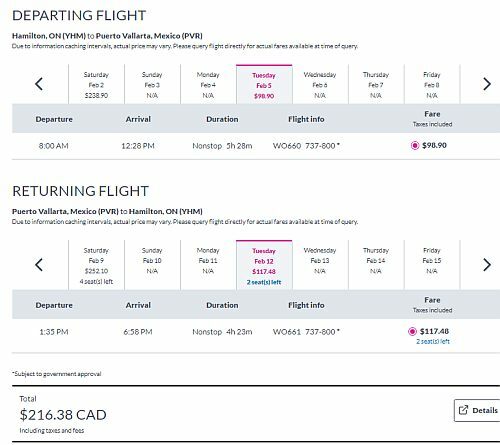 Puerto Vallarta (PVR): look for the dates that are $95 on the way there, and $114 on the way home. 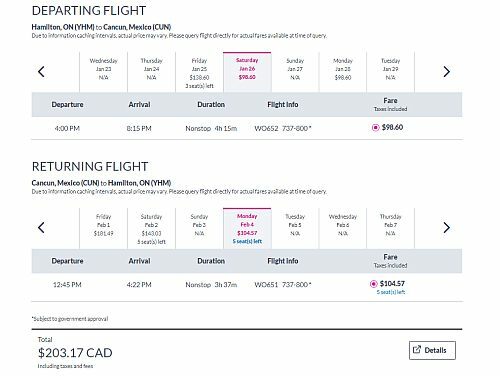 Update 11/23 - There are still a few cheap flights from Hamilton to Cancun and Puerto Vallarta, Mexico for around $200 (personal item only) to $260 (with luggage) CAD roundtrip. 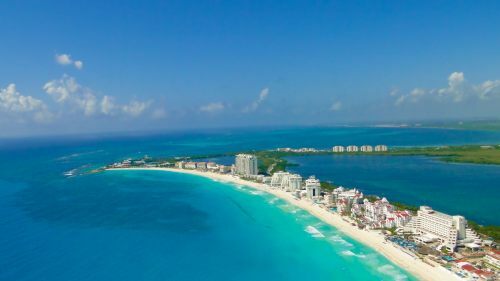 Update 12/3 - Cheap flights from Hamilton to Cancun and Puerto Vallarta, Mexico are available again today for January and February travel for around $200 (personal item only) to $260 (with luggage) CAD roundtrip. 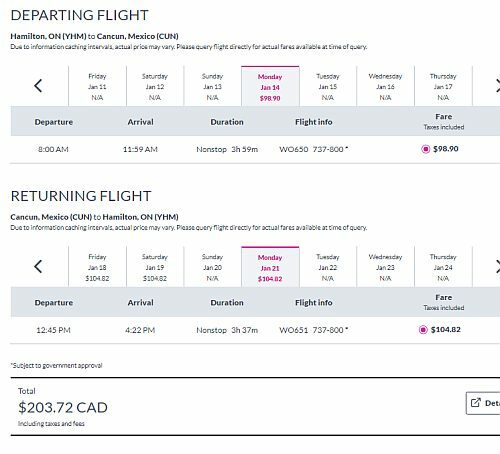 Update 1/7 - There are a few cheap flights from Hamilton to Cancun and Puerto Vallarta, Mexico available again today for January, February, and early March travel for around $200 (personal item only) to $260 (with luggage) CAD roundtrip. flight deals, united states, cancun, mexico, cun, puerto vallarta, pvr, north america, hamilton, yhm and swoop.